When her husband Hammond (Noah Emmerich) ends up on the wrong side of John Bishop (Ewan McGregor) and his men, Jane (Natalie Portman) turns to her former fiancée Dan (Joel Edgerton) to help her defend her family and her home. I always enjoy watching newer Westerns. It’s a genre that had its heyday between the 1930’s-1960’s and its archetypal characters and stories have in many ways, become the blueprint for a lot of modern western films. 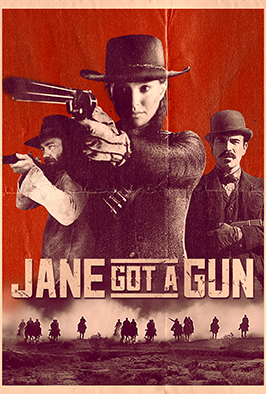 Jane Got a Gun puts a woman front and centre, showing both Jane’s trauma and strength as she fights for her loved ones. Through a series of flashbacks throughout the film you learn more about Jane and her relationships with both Hammond and Dan and see how the three of them have ended up in the situation they’re in. these flashbacks add a lot to the characters but often it feels like it’s just filling time as Jane and Dan prepare for battle. When there is the battle, it’s like a home-invasion thriller. It’s tense and exciting, though it doesn’t show off all the groundwork Jane and Dan put in to its full potential. Portman gives a dedicated performance, fully embodying the grief, fear and determination Jane has in the face of a much larger and stronger enemy than herself. It’s a pity then that Bishop feels more akin to a pantomime villain, twirling his moustache, than a fleshed-out antagonist. Jane Got a Gun is a decent addition to the Western genre. It doesn’t really do anything new or ground-breaking, but Portman’s performance and the relationship between Jane and Jan offers a compelling heart to this otherwise typical genre film. 3/5.